And don't forget Ye Vitamine! Is Uncle Sam's best ammunition! I'm guessing that this was written by that nice Mr. Murple up in McCall's Accounting department - who knew he was so talented. 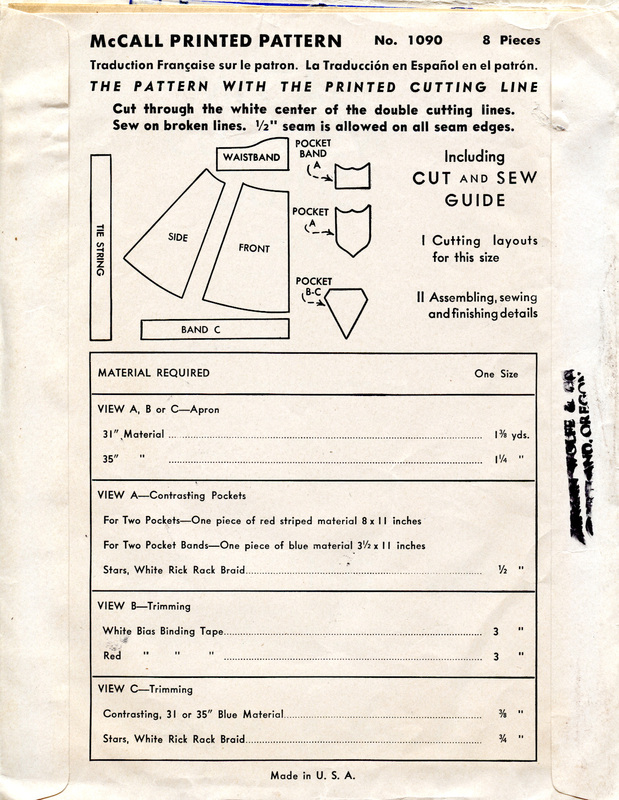 This is a lovely apron pattern - easy enough to be made by girls in home ec. classes as well as by ladies' groups. Imagine refreshments tables at dances with all the attendants in their victory aprons worn over white dresses. The rick-rack braid stars are very clever. 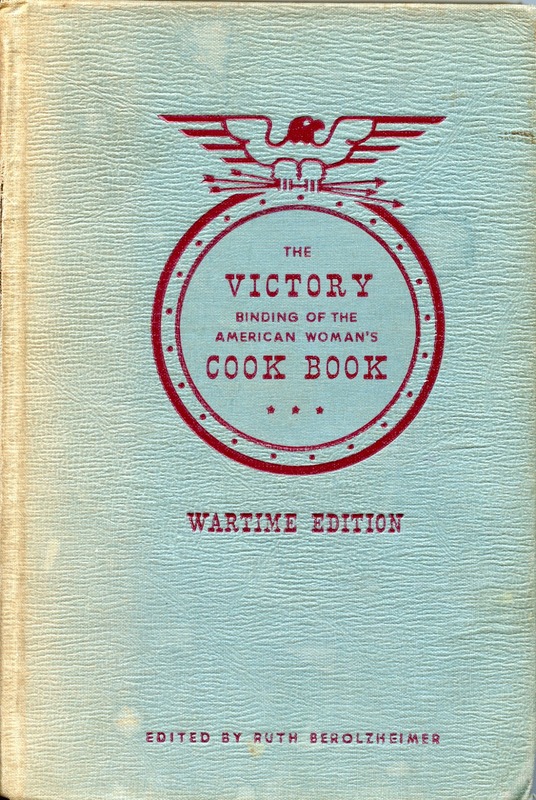 In my family we have a cookbook which we refer to as the Women's Victory Cookbook. 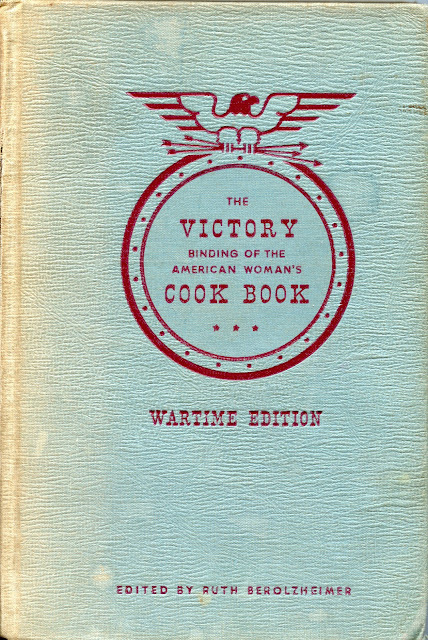 The correct name is the Victory Binding of the American Woman's Cookbook, an enormously popular cookbook of the mid-twentieth century. 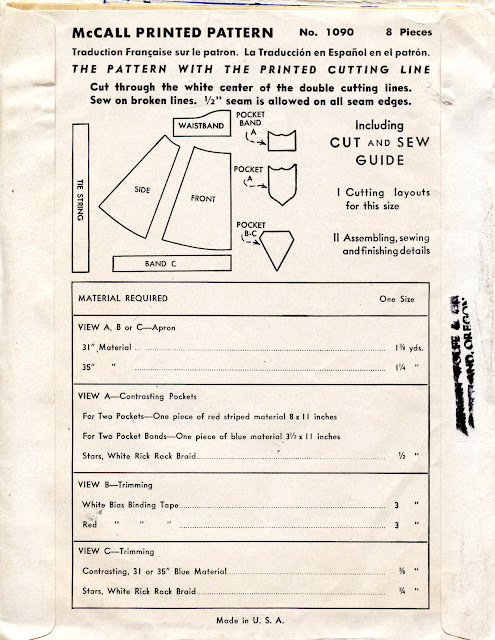 The Victory binding edition provides a small appendix on wartime cookery, which includes such contemporary-sounding advice as eating more fish and whole grains and retaining the vitamins in vegetables by not boiling them to death. Love the pattern and the cookbook. I, too, have several old cookbooks from that era. Love them all. No aprons, but we still go to the Settlement House cookbook for the important stuff. Thank for the post. The go-to cookbook in my family was Fannie Farmer. In other families I know it's Joy of Cooking. And as we tend to learn to cook from these cookbooks, so the generations go! You wouldn't want to share a few of the recipes and images from that cookbook, would you? I'd love to see some! I have searched for a copy but not found one. I adore anything from that era. I wish I'd been interested in it years ago, while my grandparents were still alive. 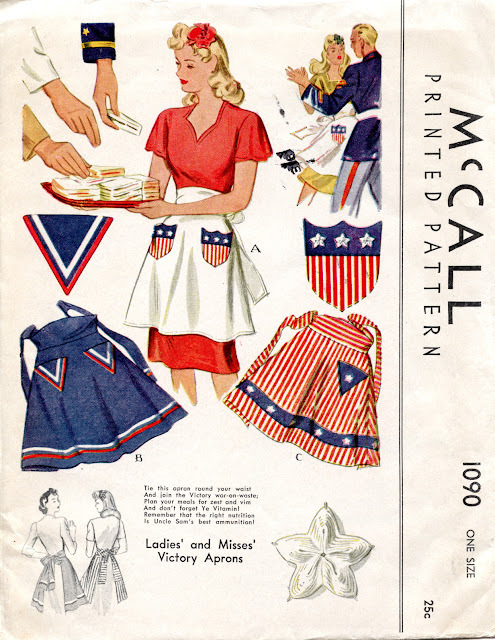 Noelani - While the Victory binding of the American Woman's Cookbook tends to be rather spendy, it's mostly just a re-packaging the plain ordinary American Woman's Cookbook, which you can find used for about $15.00. Try using bookfinder.com to search around for a copy. I have a cookbook at home that I 'borrowed' from my mother ages ago which was a wartime edition. I think it is a Good Housekeeping cook book and the wartime recipes are printed on blue paper. I just wandered over here from "Tomato Soup Cake". Love the patterns - I still have (someplace!) a couple of patterns I bought from the newspaper. I also have quite a few Depression and Wartime cook books. I think my grandmother could have fed Coxie's Army with a pound of ground beef and a cup of oatmeal! One cookbook - obviously the favorite - was wrapped with a rubber band, and eventually kept in a shoe box!